"Although I had a 'brick & mortar' gallery, I wanted a 'dream gallery' and somewhere to store my collection of art from miniature artists. This room box was created (2001). I've set it up as a working studio, and for a gallery exhibition opening, complete with wine and food." 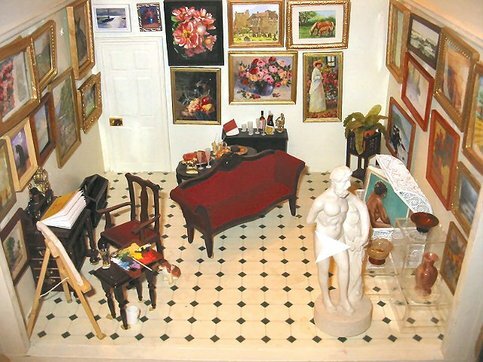 Miniature Art Society rules - where brushstrokes and all are 'miniature', size is important, as well as size in relation to subject matter - art must be viewed under magnification and 'hold' up to being 'miniature'. 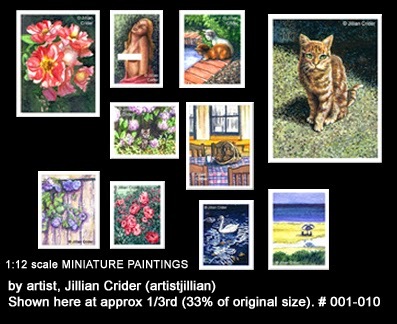 I have won awards, and belong to several societies for miniature art. (See http://www.ciderpainters.com - past award winners.) 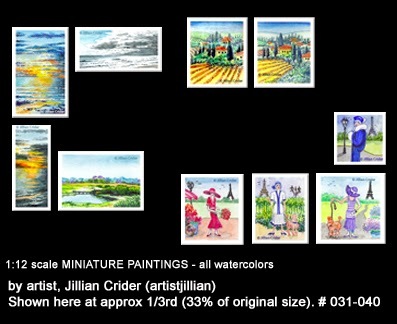 Also I've had a miniature painting tour galleries in Europe and Australia. 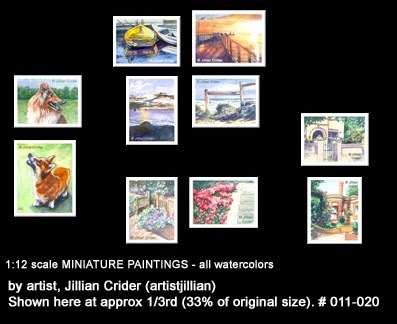 My dollhouse miniatures gallery is hosted on my 'artistjillian' website. Please follow the link to view - it is a work in progress, I'm gradually updating it. 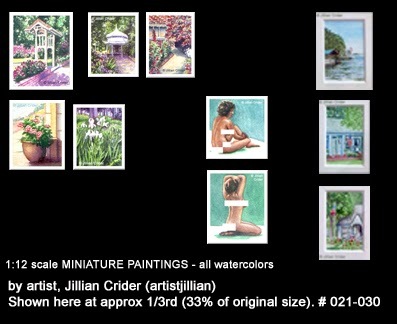 All sales of my dollhouse art are only reached by following link at the top of THIS page - see my eBay and/or Etsy accounts 'artistjillian'. If you'd like me to do something for your miniature setting - dollhouse or room box, in your theme, custom work please contact me by email. This is a selection of Page 1. This is a selection of Page 2. This is a selection of Page 3. This is a selection of Page 4.